Closed: Thanksgiving, Christmas Eve, Christmas and New Year's Day. Street parking on the University of Chicago Campus is extremely limited, we recommend giving yourself ample time to find parking before your tour. Take the University Park Line from Millennium Station. Exit train at 55th-56th-57th Street stop. Walk 5 blocks west to Woodlawn Avenue and turn left. The Robie House is accessible by public transportation or car. It is located at 5757 S. Woodlawn Avenue, on the campus of the University of Chicago, Chicago, IL. On-street parking is limited. Please allow additional time to find parking. The exterior and ground floor of the Robie House are accessible to guests in wheelchairs. The second floor, which includes the living room, dining room and kitchen, is not wheelchair accessible. The Trust has one standard-size wheelchair available at the Robie House. Walkers are permitted. All walkers will be inspected to ensure they will not damage the floors. The Trust has walkers with built-in seats available on a first-come first-served basis. 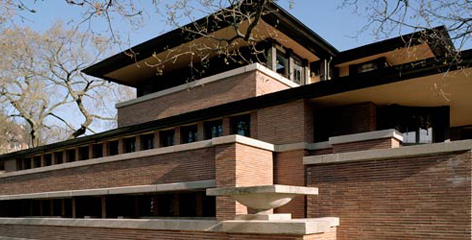 “Will Call” Ticket Holders – Check in and pick up your tickets at the Robie House Museum Shop no later than 15 minutes prior to your specified tour or event time. “eTicket” Holders – Bring your eTickets with you and check in at the Robie House Museum Shop no later than 15 minutes prior to your specified tour or event time. eTickets must be exchanged for authorized admission tickets before the tour or event.